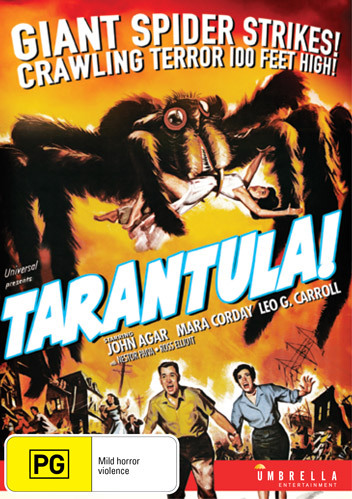 A Jack Arnold ('Creature from the Black Lagoon') atomic monster classic, 'Tarantula' is a cult extravaganza, featuring an inspired 1950s style of wild and imaginative science fiction horror. Ambitious Professor Gerald Deemer has developed an astonishing new project: a special growth formula. Testing the formula on his innocent lab tarantula in Arizona, he expects nothing more than it to double in size. But when it somehow escapes into the desert, it grows to gargantuan size and threatens to destroy everything and everyone in its path. The 'Tarantula' competition has now closed. Winners will be announced shortly. Competition opens at 5pm AEST on Sunday 29th July 2018 and closes at 11:59pm AEST on Sunday 5th August 2018. Five winners will be chosen at random on Monday 6th August 2018. To successfully win, entrants must fulfil the above entry conditions before the time the competition closes. Current members/followers are eligible to enter the competition. Only one entry per person. Only one winner per household. To be a valid winner, the entrant must not have won a prize from SWITCH within the last 28 days. Each winner will receive one DVD copy of 'Tarantula'. By entering, you agree to receive occasional emails from SWITCH in the future. If you decide to unsubscribe from these updates, any further entries will not be applicable. Only Australian residents are eligible to enter. 'Tarantula' is available on DVD on Wednesday the 1st August 2018 from Umbrella Entertainment.